In ZF3-based web sites, we use the Twitter Bootstrap CSS Framework that provides default CSS rules for styling forms and form fields. 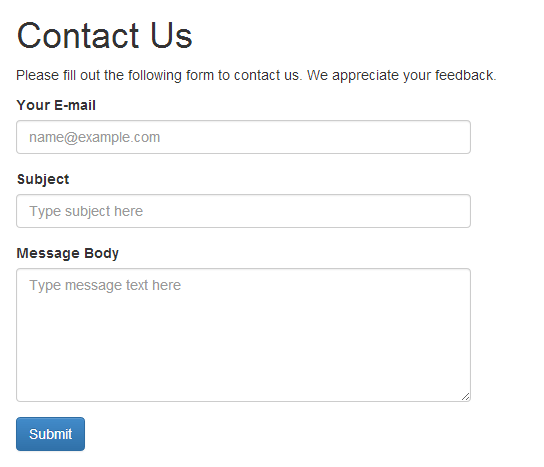 To apply the CSS rules to a form field (like <input>, <textarea>, etc. ), you should assign it the .form-control CSS class. Additionally, when using labels together with input fields, put the label-input pairs inside of <div> elements with the .form-group CSS class. For submit buttons, you can use the .btn CSS class plus a theme class like .btn-default, .btn-primary, etc. The visualization of the form is presented in figure 7.5. In the HTML markup above, we put a form inside of the 6-column-width grid cell, which makes the form half the width of the screen.